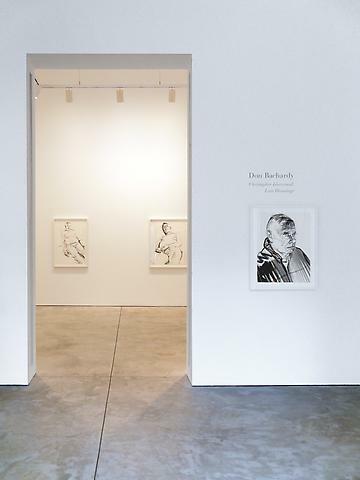 Cheim & Read is pleased to announce an exhibition of drawings by Los Angeles painter Don Bachardy. The show intimately documents the last six months of esteemed writer Christopher Isherwood's life. Barchardy's long-time partner, Isherwood died of prostate cancer in 1986. Bachardy is well-known for portraits of artists, musicians. writers and Hollywood notables including Tennessee Williams, Igor Stravinsky, Joan Didion, Anais Nin, Dorothy Parker, Lynda Benglis, David Hockney and Aldous Huxley among many others. His portraits are intentionally completed in one sitting, so as not to lose the moment's intensity. The focus and sensitivity with which Bachardy works, both in drawing and painting, captures the essence of his sitter with little extraneous information—this reductive approach echoed the work of David Hockney, and anticipated the finely lined, jewel-like portraits of Elizabeth Peyton. In Bachardy's drawings of Isherwood's last moments, the energy between artist and subject is palpable and poignant. The two men met in Santa Monica and began their relationship in 1952, when Bachardy was eighteen and Isherwood forty-eight. Age difference was only one of many hurdles for the openly gay couple, but the longevity of their partnership, which lasted over 30 years, is testimony to their commitment. Undeterred by the social prejudices of the 1950s and 60s, prevalent even among friends in Hollywood, the couple maintained a complex, romantic relationship of enviable dedication. Isherwood inevitably played a paternal role to the much-younger Bachardy, encouraging and supporting his artistic ambitions (he began making portraits in his teens). As Isherwood's cancer progressed, Bachardy made almost daily drawings of his partner's journey, an attempt to make even death a process the two could experience together. The resulting portraits are witness to a mind and body in transition. As Isherwood's illness advanced, the drawings changed accordingly—it was more difficult for Isherwood to cooperate with the sittings, and the time frame in which to make them rapidly decreased. As death neared, the drawings became sketchier and unmediated—Bachardy would sometimes do up to nine or ten images a day. Bachardy used large-format watercolor paper of varying sizes, most measuring approximately 40 x 32 inches, allowing for life-size compositions while retaining a tender intimacy with his subject. Drawing mostly with well-used Japanese brushes and black acrylic paint, Bachardy controlled the consistency of opacity and tone, adding water for more transparent lines and washes. Some images are finely nuanced and detailed, while others are quick renderings of the shadows and forms in Isherwood's progressively gaunt face. The last portraits in the series were made after Isherwood's final breaths on January 4, 1986. A documentary film about the couple, "Chris and Don: A Love Story" by Guido Santi and Tina Mascara, was released in July 2008.